Identifies and discusses two U.S. recession probability models. Shows the current and historical readings of these models. Compares the models' probabilities to the average estimate from a recent survey of economists. Provides reference material and links. Note: The previous monthly update can be seen in the March 14 article titled, "The Probability Of A U.S. Recession - March 2019." There are a variety of economic models that are supposed to predict the probabilities of recession. While I don't agree with the methodologies employed or probabilities of impending economic weakness as depicted by the following two models, I think the results of these models should be monitored. Please note that each of these models is updated regularly, and the results of these - as well as other recession models - can fluctuate significantly. The first is the "Yield Curve as a Leading Indicator" from the New York Federal Reserve. I wrote a post concerning this measure on March 1, 2010, titled "The Yield Curve as a Leading Indicator." "Smoothed recession probabilities for the United States are obtained from a dynamic-factor markov-switching model applied to four monthly coincident variables: non-farm payroll employment, the index of industrial production, real personal income excluding transfer payments, and real manufacturing and trade sales. This model was originally developed in Chauvet, M., "An Economic Characterization of Business Cycle Dynamics with Factor Structure and Regime Switching," International Economic Review, 1998, 39, 969-996." Additional details and explanations can be seen on the "U.S. Recession Probabilities" page. This model, last updated on March 29, 2019, currently shows a 3.32% probability using data through February. Data Source: Piger, Jeremy Max and Chauvet, Marcelle, Smoothed U.S. 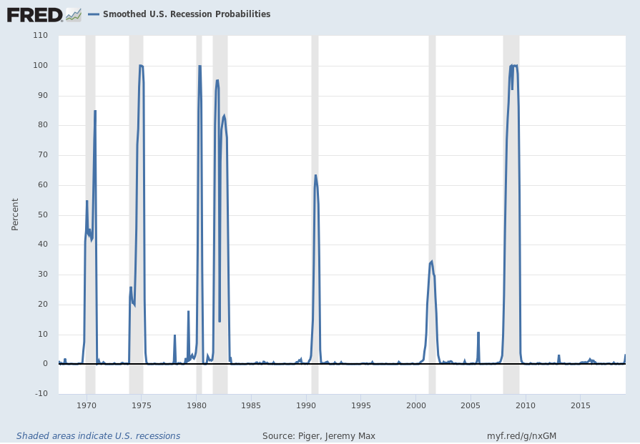 Recession Probabilities [RECPROUSM156N], retrieved from FRED, Federal Reserve Bank of St. Louis, accessed April 6, 2019: Smoothed U.S. Recession Probabilities. The two models featured above can be compared against measures seen in recent posts. For instance, as seen in the March 14, 2019 post titled "The March 2019 Wall Street Journal Economic Forecast Survey" economists surveyed averaged a 24.51% probability of a U.S. recession within the next 12 months. SPX at 2,892.74 as this post is written.